Just published: Mulder, M. (2019). The Global Need for Competence: Competence-based VET and Implications for Policy and Practice. In: A. Bahl and A. Dietzen (Eds.). Work-based Learning as a Pathway to Competence-based Education. Bonn: Unevoc Network, 44-65. What sustainability competencies do developing countries need? As promised, the abstract of the article of Yared Demssie in the Journal of Cleaner Production on sustainability competencies in developing countries is posted here. Continue reading What sustainability competencies do developing countries need? A literature review of Anahuac Valero on scaffolding first and second order scaffolding of argumentation competence development is accepted for publication by the journal Technology, Pedagogy and Education. When the article is published more information about the content of the article will be posted here. Honoured with the visit of Amy Harder, Grady Roberts, Robert Strong and Jimmy Lindner on February 25 to talk about future developments in the field of agricultural extension and education. Thanks for the great time, and lots of success with your plans! Doei!!! Research of Yared Demssie from Ethiopia on sustainaibility competence identification in developing countries is accepted for publication by the Journal of Cleaner Production. Once the manuscript is published online, the abstract will be posted here. Full reference up to now: Demssie, Y., Wesselink, R., Biemans, H.J.A., & Mulder, M. (accepted February 25, 2019). Think outside the European box: Identifying sustainability competencies for a base of the pyramid context. Journal of Cleaner Production. Research of Stan van Ginkel on the application of a virtual reality system in oral presentation education has been accepted for publication in Computers & Education. The full reference of the publication is: Van Ginkel, S., Gulikers, J., Biemans, H.J.A., Bos, T., Van Tilborg, R., Van Halteren, M., Roozen, M., & Mulder, M. (Accepted). Fostering Oral Presentation Competence Through a Virtual Reality-Based Task for Delivering Feedback. Computers & Education. When the article is online, we will share the DOI. 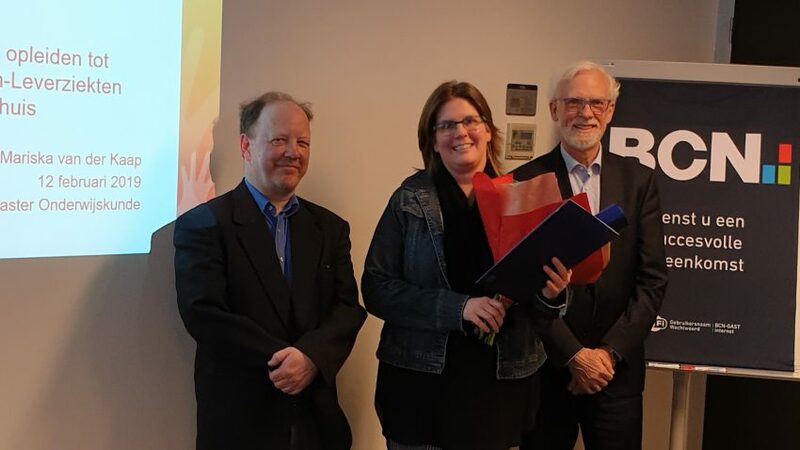 Mariska van der Kaap heeft op 12 februari 2019 met succes haar scriptie voor de NCOI Masteropleiding Onderwijskunde (MEd) verdedigd. Titel van de scriptie: ‘Lokale effecten van het nieuwe landelijke opleidingsplan NOVUM: Onderscheidend en inspirerend opleiden tot Medisch Specialist in Maag-Darm-Leverziekten binnen het Flevoziekenhuis’. Hartelijk dank Dr. Joachim Wetterling voor de goede begeleiding.